Black Cat Pudding Cups are a fun and easy way to dress up Snack Pack Chocolate Pudding Cups for Halloween! How fun are these? You know I love making cute things (see pandas, penguins, and monkeys) but I hadn’t done anything Halloween themed. Halloween holds a special place in my heart because I got engaged on Halloween seven years ago (holy cow). Anyway, I love decorating for fall/Halloween but not in the gory, scary way. I’m more Casper and fun cats than zombies and blood/slime. We went to Meijer for our weekly grocery shop last week and I picked up these chocolate Snack Pack pudding cups. They come in a ton of flavors but I stuck with Milk Chocolate and Chocolate Fudge because I knew I wanted to make black cats. Julia is a fan of all things cat so I wanted to incorporate something fun that she’ll enjoy. Side note: If you’re a Meijer shopper, are you an mPerks member? I’ve been signed up for months but couldn’t remember my pin. I have a tendency to do that – I have too many passwords floating around in my head. Anyway, if you aren’t, you should sign up, it’s free & totally worth it. They text me coupons all the time that save me a bunch of money, now that I figured out my pin. Back to the cats. There are so many ways that you can mix in other fun candies (gummie worms, Snack Pack pudding bars as headstones, crumbled cookies as dirt, etc.) but I had a flash back to school Halloween parties and wanted to make something fun that didn’t necessarily have to be eaten immediately. I’m sure things have changed but I remember getting SO many treats that I couldn’t finish them all so I wanted to make something that could be easily transported. Also, Snack Pack pudding cups have as much calcium as an 8 oz glass of milk which is a nice addition to all the Halloween sweets. I made a cat head template in Photoshop and included it for you below. I picked up some sparkly foam paper that is sticky on one side and some fun googly eyes. I also grabbed these adorable hat stickers and bats and they were the perfect addition. I liked giving them different personalities so some got pipe cleaner whiskers, some got big eyes…you get the idea. Have fun! Black Cat Snack Pack Pudding Cups are perfect for Halloween parties! 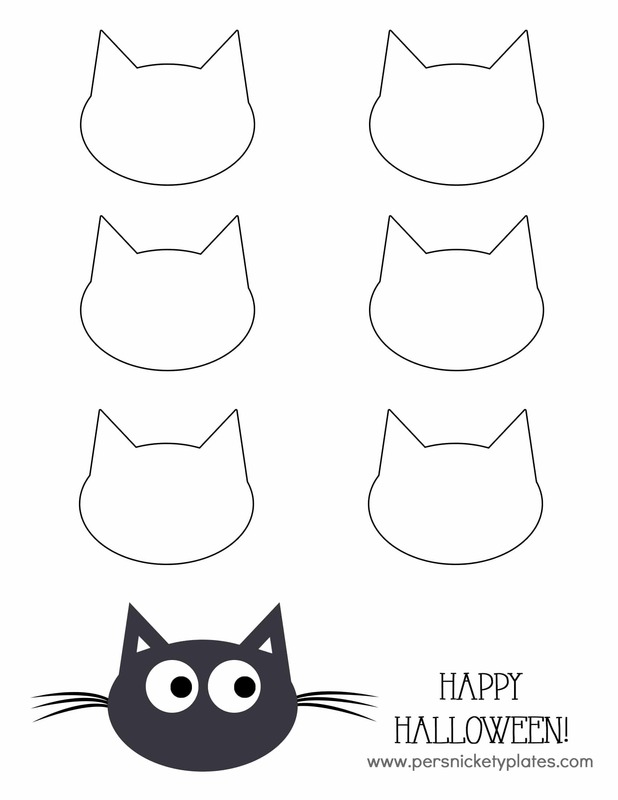 Print out the template and cut out the cat faces from the black paper. Glue on the googly eyes and add any stickers. Glue on the pipe cleaner whiskers. Flip the Snack Pack over and use the hot glue (set on the low temp) to add some glue to the head and stick it to the pudding cup. Repeat as many times as you need making different faces. Visit Snack Pack’s Pinterest page for so many more fun ideas or their Facebook page. Are you ready for Halloween? Are you making any class snacks? The sparkly cats looks so fun. Perfect for Halloween! Those are cute. I like the glittery paper. we just bought some puddings the other day. Decorating them like this would make my daughter ecstatic. Thanks for the fun idea. These are adorable and would make the perfect treat for my son’s school party next week. Thanks for sharing! This is amazing! My nieces absolutely love cats so I need to do this with them for Halloween. They have birthdays coming up so I’ll have to surprise them with this. Hehehe- these are so cute! This remind me of my childhood cat, Lucky. These pudding cups are adorable! My kids would love these!